Le Trèfle enjoys a lot of praise and recognition from most customers, which brings us great satisfaction and encouragement to keep pushing forward (thank you very much). At the same time, some people rate us as “nice food, but pricey” and I’d like to address that in this post. Why? The science of climate change is there and if we want to do something about it we should probably start making different life choices. That includes the way we do business. As Einstein once famously said, we cannot solve problems with the same mindset that created them. In other words, businesses can no longer consciously focus solely on profit; environmental and social responsibility must be equally factored into the solution. From a high-level perspective, the current food system is utterly unsustainable. It uses more fossil fuels than any other industry. Worldwide, agriculture accounts for 70% of all water consumption, compared to 20% for industry and 10% for domestic use. Nearly 40% of all food produced is wasted. There’s enormous pressure on all of us to buy food that is cheap, unhealthy, high in calories, sugar, fat, and sodium from large food corporations, driving obesity, heart diseases and diabetes. Le Trèfle wants to provide an alternative to this. We prioritise sustainable, organic, local and seasonal produce whenever we can. We make most of our food from scratch, always pushing the limits of our kitchen equipment and skills to keep all the nasties away from our food. What cannot be made in-house is bought from other local farmers and artisans – who are paid a fair price for their products – not only to reduce food miles, but also to keep the local economy afloat and preserve biodiversity. We promote healthy eating not through the latest fad diets or trendy superfoods. Instead, we prioritise clean, fresh produce and quality ingredients put together in balanced meals. Ok, our signature dish is crêpes, which can be perceived as an unhealthy indulgence by many, but even there we use organic unbleached wheat flour, free-range eggs, milk from happy cows, and make all our toppings in-house from natural ingredients (except for, uh, Nutella). 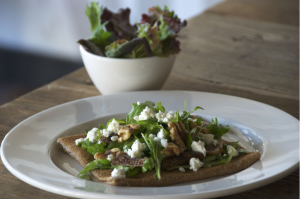 Our galettes (savoury crêpes), on the other hand, are fully made from scratch – we mill our own buckwheat flour in-house – and are complemented with high-quality ingredients. Furthermore, alternatives to crêpes and galettes are available in our menu. For restaurants eager to maintain a competitive edge, padding a menu with ready-made dishes is economically attractive — even if no one dares to admit it. By relying increasingly over the years on fast and pre-prepared food in most arenas of our lives, we — including, at this point, the celebrated French — have allowed un-fresh food to take over. Exactly the same thing happens in Australia, to the point where importing baguettes frozen from overseas makes more financial sense than buying organic bread, made by hand in Sydney. In France nowadays up to 80% of the croissants are made in a centralised plant and heated onsite, according to Philippe Godard, a spokesman for the French bakery and patisserie business federation. We could easily do that too, but we choose not to because environmentally (food miles) and socially (production value chain and jobs located overseas) it makes no sense at all. Which means we probably cannot compete with the average food joint on price, but we can arguably beat them on quality. Restaurants are also eminently cash-based businesses. It is very easy to operate on the basis of payments taken over the counter, i.e. unregistered sales, and payments to personnel cash-in-hand (therefore avoiding taxes and other administrative dues). We choose not to do that either because paying taxes is one of the ways how individuals and businesses give back to the communities where they live and operate. We also choose to pay industry award – including weekend penalty rates – to all our staff, at a minimum. Along with our efforts towards environmental responsibility, this is where the social responsibility kicks in. And this is what I mean by ethical business. But that’s the legal minimum, one might argue. Granted, but it’s far from being the norm in the industry – just ask a little around. Making food from scratch means that a higher labour cost component must be factored into the overall cost structure, even in tightly-run kitchens. To give you an example, it takes two hours in front of the stove to make dulce de leche (milk caramel) from pure milk. It may seem trivial, but compare the hourly cost of a kitchen hand or chef with the price of an off-the-shelf jar (full of thickeners, colouring, added flavours, sodium and preservatives). As discussed above, food waste is a global phenomenon. We try our hardest to minimise our waste and, when we do need to throw stuff away, we pay extra money to have appropriate waste bins for recycling and composting. In the near future, we’ll make our own compost in-house to feed a projected veggie garden at the back of the premises. I also opted to buy electricity to run our cool room, fridges, LED lamps and other electrical equipment from 100% renewable sources. A foolish idea? Maybe. But is only through supporting the development of renewable energies that we’ll mitigate our dependence on a fossil fuel-based economy. So, what’s a fair price to pay for a meal? “Buying local, seasonal and organic, how hard can it be?”, I thought when I started. Avocados at $5.00 a pop anyone? The final menu price is usually a 1:3 – 1:5 factor of the food cost to cover refrigeration, labour to prepare, present and serve the food, wash the dishes, replace crockery, cutlery glasses, staff training, etc. That ratio varies from one restaurant to the other, and even between dishes and products within a same restaurant. It would theoretically mean that a simple avocado, for instance – costing $5.00 to the restaurant owner – would have to be priced somewhere between $15 – $25. This is a simplistic example – in reality restaurants typically deal with cost fluctuations by spreading margins across products to keep price consistent, often meaning selling something at a loss – but you get the idea. As organic farming techniques are closing the gap on conventional yields, we might be able to offer organic meat at reasonable prices soon. In conclusion, the price that you pay for cheap food in reality carries a hidden, higher social and environmental cost. It may not get out of your pocket now, but it will tomorrow.